Soft, bone-chilling cold winter without feeling,colorful, can meet the different tastes of individual pursuit. Made with acrylic crafts and jewelry very resistant enough use, but also has environmental effects , the extent of radiation of the body's own bone is almost the same. is appearance, diverse design , eye-catching , and gradually occupy an increasingly large market share in high-end gifts signs , and become the first choice of many gift companies recruit brand material. 1. Wathering and acid and alkali resistance, not because of years of using the sun and rain and yellowing discoloration phenomenon, and easy to maintain, easy to clean. 2. Light and excellent acrylic material mainly through strong and well-known, especially made of lighting, the desired light intensity is small, very save energy. 3. 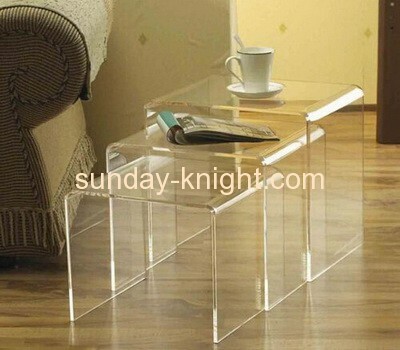 Fight strong, it is 16 times that of ordinary glass, suitable for installation in special needs safe zone. 4. Excellent insulation properties, suitable for all kinds of electrical equipment. 5. Colorful, high brightness, strong permeability, very suitable for gifts crafts. 6. Plasticity, shape changes, it is easy to process molding. 7. Recyclable rate, is increasingly recognized strengthen environmental awareness. Acrylic color is more transparent color, it can be divided into a clear, red, yellow, blue, green, white, gray, black, etc., as well as gold and silver mirror. With the improvement of people's living standards, acrylic in the gift market outlook is getting better and better, acrylic its light, strong, beautiful and so won the people's favorite. For example, acrylic photo frame, seamless frame can save photos from a long damp, not color, well preserved photos.